ICl has a dipole moment and Br2 does not. The dipole moment increases the intermolecular attractions between ICl molecules and causes that substance to have a higher melting point than bromine. Classify the species into three categories: ionic, polar (possessing a dipole moment), and nonpolar. Keep in mind that dispersion forces exist between all species. The three molecules are essentially nonpolar. There is little difference in electronegativity between carbon and hydrogen. Thus, the only type of intermolecular attraction in these molecules is dispersion forces. Other factors being equal, the molecule with the greater number of electrons will exert greater intermolecular attractions. By looking at the molecular formulas you can predict that the order of increasing boiling points will be CH4 < C3H8 < C4H10. Butane would be a liquid in winter (boiling point -44.5°C), and on the coldest days even propane would become a liquid (boiling point -0.5°C). Only methane would remain gaseous (boiling point -161.6°C). All are tetrahedral (AB4 type) and are nonpolar. Therefore, the only intermolecular forces possible are dispersion forces. Without worrying about what causes dispersion forces, you only need to know that the strength of the dispersion force increases with the number of electrons in the molecule (all other things being equal). As a consequence, the magnitude of the intermolecular attractions and of the boiling points should increase with increasing molar mass. Benzene (C6H6) molecules are nonpolar. Only dispersion forces will be present. Chloroform (CH3Cl) molecules are polar (why?). Dispersion and dipole-dipole forces will be present. Phosphorus trifluoride (PF3) molecules are polar. Dispersion and dipole-dipole forces will be present. Sodium chloride (NaCl) is an ionic compound. Dispersion and ionic forces will be present. Carbon disulfide (CS2) molecules are nonpolar. Only dispersion forces will be present. The center ammonia molecule is hydrogen-bonded to two other ammonia molecules. In this problem you must identify the species capable of hydrogen bonding among themselves, not with water. In order for a molecule to be capable of hydrogen bonding with another molecule like itself, it must have at least one hydrogen atom bonded to N, O, or F. Of the choices, only (e) CH3COOH (acetic acid) shows this structural feature. The others cannot form hydrogen bonds among themselves. CO2 is a nonpolar molecular compound. The only intermolecular force present is a relatively weak dispersion force (small molar mass). CO2 will have the lowest boiling point. CH3Br is a polar molecule. Dispersion forces (present in all matter) and dipole-dipole forces will be present. This compound has the next highest boiling point. CH3OH is polar and can form hydrogen bonds, which are especially strong dipole-dipole attractions. Dispersion forces and hydrogen bonding are present to give this substance the next highest boiling point. RbF is an ionic compound (Why?). Ion-ion attractions are much stronger than any intermolecular force. RbF has the highest boiling point. The molecule with the stronger intermolecular forces will have the higher boiling point. If a molecule contains an N-H, O-H, or F-H bond it can form intermolecular hydrogen bonds. A hydrogen bond is a particularly strong dipole-dipole intermolecular attraction. 1-butanol has greater intermolecular forces because it can form hydrogen bonds. (It contains an O-H bond.) Therefore, it has the higher boiling point. Diethyl ether molecules do contain both oxygen atoms and hydrogen atoms. However, all the hydrogen atoms are bonded to carbon, not oxygen. There is no hydrogen bonding in diethyl ether, because carbon is not electronegative enough. Cl2: it is larger than O2 (both are nonpolar) and therefore has stronger dispersion forces. SO2: it is polar (most important) and also is larger than CO2 (nonpolar). Larger size implies stronger dispersion forces. HF: although HI is larger and should therefore exert stronger dispersion forces, HF is capable of hydrogen bonding and HI is not. Hydrogen bonding is the stronger attractive force. Xe: it is larger and therefore stronger dispersion forces. CS2: it is larger (both molecules nonpolar) and therefore stronger dispersion forces. Cl2: it is larger (both molecules nonpolar) and therefore stronger dispersion forces. LiF: it is an ionic compound, and the ion-ion attractions are much stronger than the dispersion forces between F2 molecules. NH3: it can form hydrogen bonds and PH3 cannot. NH3 has a higher boiling point because it is polar and can form hydrogen bonds; CH4 is nonpolar and can only form weak attractions through dispersion forces. KCl is an ionic compound. Ion-Ion forces are much stronger than any intermolecular forces. I2 is a nonpolar molecular substance; only weak dispersion forces are possible. Classify the species into three categories: ionic, polar (possessing a dipole moment), and nonpolar. Also look for molecules that contain an N-H, O-H, or F-H bond, which are capable of forming intermolecular hydrogen bonds. Keep in mind that dispersion forces exist between all species. Water has O-H bonds. Therefore, water molecules can form hydrogen bonds. The attractive forces that must be overcome are dispersion and dipole-dipole, including hydrogen bonding. Bromine (Br2) molecules are nonpolar. The forces that must be overcome are dispersion only. Iodine (I2) molecules are nonpolar. The forces that must be overcome are dispersion only. In this case, the F-F bond must be broken. This is an intramolecular force between two F atoms, not an intermolecular force between F2 molecules. The attractive forces that must be overcome are covalent bonds. Both molecules are nonpolar, so the only intermolecular forces are dispersion forces. The linear structure (n-butane) has a higher boiling point (-0.5°C) than the branched structure (2-methylpropane, boiling point -11.7°C) because the linear form can be stacked together more easily, facilitating intermolecular attraction. The compound with –NO2 and –OH groups on adjacent carbons can form hydrogen bonds with itself (intramolecular hydrogen bonds). Such bonds do not contribute to intermolecular attraction and do not help raise the melting point of the compound. The other compound, with the –NO2 and –OH groups on opposite sides of the ring, can form only intermolecular hydrogen bonds; therefore it will take a higher temperature to escape into the gas phase. Ethanol molecules can attract each other with strong hydrogen bonds; dimethyl ether molecules cannot (why?). The surface tension of ethanol is greater than that of dimethyl ether because of stronger intermolecular forces (the hydrogen bonds). Note that ethanol and dimethyl ether have identical molar masses and molecular formulas so attractions resulting from dispersion forces will be equal. Ethylene glycol has two -OH groups, allowing it to exert strong intermolecular forces through hydrogen bonding. Its viscosity should fall between ethanol (1 OH group) and glycerol (3 OH groups). Plot ln P versus 1/T. According to the Clausius-Clapeyron equation (Equation 12.1), the slope of this plot is . Before using the data, be sure to convert temperatures to kelvins and pressures to pascals. The plot of ln(P) versus 1/T is shown below along with the linear regression line. 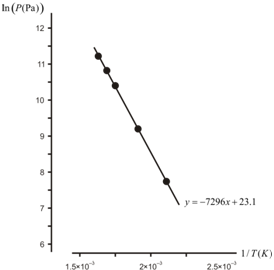 The slope of the regression line is –7296. Setting this slope equal to and solving for gives . Using equation 12.4, plug in the given data and solve for P2. Be sure to first convert temperatures to kelvins before substituting. P1 = 40.1 mmHg P2 = ? According to the graph, liquid X has a more negative slope. So, we can conclude that liquid X has a larger than does liquid Y. In a simple cubic structure each sphere touches six others on the ±x, ±y and ±z axes. In a body-centered cubic lattice each sphere touches eight others. Visualize the body-center sphere touching the eight corner spheres. A corner sphere is shared equally among eight unit cells, so only one-eighth of each corner sphere "belongs" to any one unit cell. A face-centered sphere is divided equally between the two unit cells sharing the face. A body-centered sphere belongs entirely to its own unit cell. In a simple cubic cell there are eight corner spheres. One-eighth of each belongs to the individual cell giving a total of one sphere per cell. In a body-centered cubic cell, there are eight corner spheres and one body-center sphere giving a total of two spheres per unit cell (one from the corners and one from the body-center). In a face-center cubic cell, there are eight corner spheres and six face-centered spheres (six faces). The total number would be four spheres: one from the corners and three from the faces. What type of cubic cell is this? First, we need to calculate the volume (in cm3) occupied by 1 mole of Ba atoms. Next, we calculate the volume that a Ba atom occupies. Once we have these two pieces of information, we can multiply them together to end up with the number of Ba atoms per mole of Ba. We carry an extra significant figure in this calculation to limit rounding errors. Next, the volume that contains two barium atoms is the volume of the body-centered cubic unit cell. Some of this volume is empty space because packing is only 68.0 percent efficient. But, this will not affect our calculation. Let’s also convert to cm3. We can now calculate the number of barium atoms in one mole using the strategy presented above. This is close to Avogadro’s number, 6.022 ´ 1023 particles/mol. There are two vanadium atoms per unit cell. The mass of the unit cell is the mass in grams of two europium atoms. Recall that a corner atom is shared with 8 unit cells and therefore only 1/8 of corner atom is within a given unit cell. Also recall that a face atom is shared with 2 unit cells and therefore 1/2 of a face atom is within a given unit cell. See Figure 12.18 of the text. In a face-centered cubic unit cell, there are atoms at each of the eight corners, and there is one atom in each of the six faces. Only one-half of each face-centered atom and one-eighth of each corner atom belongs to the unit cell. The unit cell is the smallest repeating unit in the crystal; therefore, the empirical formula is XY3. are also four Zn2+ ions. Therefore, the formula of zinc oxide is ZnO. See Table 12.4 of the text. The properties listed are those of an ionic solid. See Table 12.4 of the text. The properties listed are those of a molecular solid. See Table 12.4 of the text. The properties listed are those of a covalent solid. In a molecular crystal the lattice points are occupied by molecules. Of the solids listed, the ones that are composed of molecules are Se8, HBr, CO2, P4O6, and SiH4. In covalent crystals, atoms are held together in an extensive three-dimensional network entirely by covalent bonds. Of the solids listed, the ones that are composed of atoms held together by covalent bonds are Si and C.
Carbon dioxide forms molecular crystals; it is a molecular compound and can only exert weak dispersion type intermolecular attractions because of its lack of polarity. Boron is a nonmetal with an extremely high melting point. It forms covalent crystals like carbon (diamond). Sulfur forms molecular crystals; it is a molecular substance (S8) and can only exert weak dispersion type intermolecular attractions because of its lack of polarity. KBr forms ionic crystals because it is an ionic compound. Mg is a metal; it forms metallic crystals. SiO2 (quartz) is a hard, high melting nonmetallic compound; it forms covalent crystals like boron and C (diamond). LiCl is an ionic compound; it forms ionic crystals. Cr (chromium) is a metal and forms metallic crystals. Diamond: each carbon atom is covalently bonded to four other carbon atoms. Because these bonds are strong and uniform, diamond is a very hard substance. Graphite: the carbon atoms in each layer are linked by strong bonds, but the layers are bound by weak dispersion forces. As a result, graphite may be cleaved easily between layers and is not hard. In graphite, all atoms are sp2 hybridized; each atom is covalently bonded to three other atoms. The remaining unhybridized 2p orbital is used in pi bonding forming a delocalized molecular orbital. The electrons are free to move around in this extensively delocalized molecular orbital making graphite a good conductor of electricity in directions along the planes of carbon atoms. We can then calculate the amount of heat. Step 1: Warming ice to the melting point. Step 3: Heating water from 0°C to 100°C. Step 5: Heating steam from 100°C to 146°C. How would you set up and work this problem if you were computing the heat lost in cooling steam from 126°C to ice at -10°C? Other factors being equal, liquids evaporate faster at higher temperatures. The greater the surface area, the greater the rate of evaporation. Weak intermolecular forces imply a high vapor pressure and rapid evaporation. The substance with the lowest boiling point will have the highest vapor pressure at some particular temperature. Thus, butane will have the highest vapor pressure at -10°C and toluene the lowest. Two phase changes occur in this process. First, the liquid is turned to solid (freezing), then the solid ice is turned to gas (sublimation). The solid ice turns to vapor (sublimation). The temperature is too low for melting to occur. When steam condenses to liquid water at 100°C, it releases a large amount of heat equal to the enthalpy of vaporization. Thus steam at 100°C exposes one to more heat than an equal amount of water at 100°C. The pressure exerted by the blades on the ice lowers the melting point of the ice. A film of liquid water between the blades and the solid ice provides lubrication for the motion of the skater. The main mechanism for ice skating, however, is due to friction. Initially, the ice melts because of the increase in pressure. As the wire sinks into the ice, the water above the wire refreezes. Eventually the wire actually moves completely through the ice block without cutting it in half. Region labels: The region containing point A is the solid region. The region containing point B is the liquid region. The region containing point C is the gas region. Water vapor would solidify without becoming a liquid. Boiling liquid ammonia requires breaking hydrogen bonds between molecules. Dipole-dipole and dispersion forces must also be overcome. P4 is a nonpolar molecule, so the only intermolecular forces are of the dispersion type. CsI is an ionic solid. To dissolve in any solvent ion-ion interparticle forces must be overcome. Metallic bonds must be broken. A low surface tension means the attraction between molecules making up the surface is weak. Water has a high surface tension; water bugs could not "walk" on the surface of a liquid with a low surface tension. A low critical temperature means a gas is very difficult to liquefy by cooling. This is the result of weak intermolecular attractions. Helium has the lowest known critical temperature (5.3 K). A low boiling point means weak intermolecular attractions. It takes little energy to separate the particles. All ionic compounds have extremely high boiling points. A low vapor pressure means it is difficult to remove molecules from the liquid phase because of high intermolecular attractions. Substances with low vapor pressures have high boiling points (why?). Thus, only choice (d) indicates strong intermolecular forces in a liquid. The other choices indicate weak intermolecular forces in a liquid. The properties of hardness, high melting point, poor conductivity, and so on, could place boron in either the ionic or covalent categories. However, boron atoms will not alternately form positive and negative ions to achieve an ionic crystal. The structure is covalent because the units are single boron atoms. CCl4. Generally, the larger the molecule greater its polarizability. Recall that polarizability is the ease with which the electron distribution in an atom or molecule can be distorted. There are essentially no separate strands in solution at 300 K.
Determine the number of base pairs and the total length of the molecule. Because the critical temperature of CO2 is only 31°C, the liquid CO2 in the fire extinguisher vaporizes above this temperature, no matter the applied pressure inside the extinguisher. 31°C is approximately 88°F, so on a hot summer day, no liquid CO2 will exist inside the extinguisher, and hence no sloshing sound would be heard. The vapor pressure of mercury (as well as all other substances) is 760 mmHg at its normal boiling point. As the vacuum pump is turned on and the pressure is reduced, the liquid will begin to boil because the vapor pressure of the liquid is greater than the external pressure (approximately zero). The heat of vaporization is supplied by the water, and thus the water cools. Soon the water loses sufficient heat to drop the temperature below the freezing point. Finally the ice sublimes under reduced pressure. It has reached the critical point; the point of critical temperature (Tc) and critical pressure (Pc). The graph is shown below. See Table 8.1 of the text for the lattice energies. As the separation increases, less work is needed to pull the ions apart; therefore, the lattice energies become smaller as the interionic distances become larger. This is in accordance with Coulomb's law. 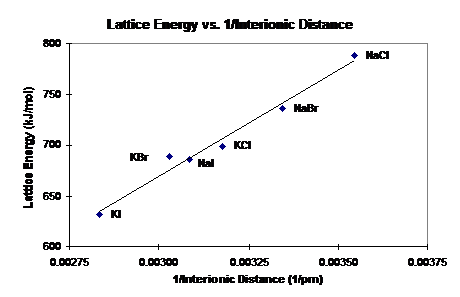 From these data what can you conclude about the relationship between lattice energy and the size of the negative ion? What about lattice energy versus positive ion size (compare KCl with NaCl, KBr with NaBr, etc.)? Crystalline SiO2. Its regular structure results in a more efficient packing. W must be a reasonably non-reactive metal. It conducts electricity and is malleable, but doesn’t react with nitric acid. Of the choices, it must be gold. X is nonconducting (and therefore isn’t a metal), is brittle, is high melting, and reacts with nitric acid. Of the choices, it must be lead sulfide. Y doesn’t conduct and is soft (and therefore is a nonmetal). It melts at a low temperature with sublimation. Of the choices, it must be iodine. Z doesn’t conduct, is chemically inert, and is high melting (network solid). Of the choices, it must be quartz (SiO2). False. Permanent dipoles are usually much stronger than temporary dipoles. False. The hydrogen atom must be bonded to N, O, or F.
A: Steam B: Water vapor. From Figure 12.34, the sublimation temperature is -78°C or 195 K at a pressure of 1 atm. The average separation between particles decreases from gases to liquids to solids, so the ease of compressibility decreases in the same order. In solids, the molecules or atoms are usually locked in a rigid 3-dimensional structure which determines the shape of the crystal. In liquids and gases the particles are free to move relative to each other. The trend in volume is due to the same effect as part (a). K2S: Ionic forces are much stronger than the dipole-dipole forces in (CH3)3N. CH4 is a tetrahedral, nonpolar molecule that can only exert weak dispersion type attractive forces. SO2 is bent (why?) and possesses a dipole moment, which gives rise to stronger dipole-dipole attractions. SO2 will behave less ideally because it is polar and has greater intermolecular forces. LiF, ionic bonding and dispersion forces; BeF2, ionic bonding and dispersion forces; BF3, dispersion forces; CF4, dispersion forces; NF3, dipole-dipole interaction and dispersion forces; OF2, dipole-dipole interaction and dispersion forces; F2, dispersion forces. The Li-Cl bond length is longer in the solid phase because each Li+ is shared among several Cl- ions. In the gas phase the ion pairs (Li+ and Cl-) tend to get as close as possible for maximum net attraction. Smaller ions can approach water molecules more closely, resulting in larger ion-dipole interactions. The greater the ion-dipole interaction, the larger is the heat of hydration. If water were linear, the two O-H bond dipoles would cancel each other as in CO2. Thus a linear water molecule would not be polar. Hydrogen bonding would still occur between water molecules even if they were linear. As expected, the bond enthalpy represented in part (b) is much greater than the energy of vaporization represented in part (a). It requires more energy to break the bond than to vaporize the molecule. Water molecules can attract each other with strong hydrogen bonds; diethyl ether molecules cannot (why?). The surface tension of water is greater than that of diethyl ether because of stronger intermolecular forces (the hydrogen bonds). Conversion to solid HgO changes its surface tension. Initial state: one solid phase, final state: two solid phase components and one gas phase component. CaCO3 and CaO constitute two separate solid phases because they are separated by well-defined boundaries. SiO2 has an extensive three-dimensional structure. CO2 exists as discrete molecules. It will take much more energy to break the strong network covalent bonds of SiO2; therefore, SiO2 has a much higher boiling point than CO2. The molecules are all polar. The F atoms can form H-bonds with water and other –OH and –NH groups in the membrane, so water solubility plus easy attachment to the membrane would allow these molecules to pass the blood-brain barrier. Life as we know it requires the liquid state. Ammonia has a much more narrow temperature range in which it is a liquid. Its much lower heat capacity would likely also be a problem. The large heat capacity of water is essential to maintaining constant (or nearly constant) body temperatures. The time required to cook food depends on the boiling point of the water in which it is cooked. The boiling point of water increases when the pressure inside the cooker increases. The moles of water vapor can be calculated using the ideal gas equation. Now, we can calculate the percentage of the 1.20 g sample of water that is vapor. Extra heat produced when steam condenses at 100°C. Avoids extraction of ingredients by boiling in water. Remember, there are two atoms per body-centered cubic unit cell. Remember, there are four atoms per face-centered cubic unit cell. No. There is no solid-vapor phase boundary. Rhombic sulfur is converted to monoclinic sulfur, which is subsequently converted to liquid sulfur and then to sulfur vapor. Pumping allows Ar atoms to escape, thus removing heat from the liquid phase. Eventually the liquid freezes. The slope of the solid-liquid line of cyclohexane is positive. Therefore, its melting point increases with pressure. These droplets are super-cooled liquids. When the dry ice is added to water, it sublimes. The cold CO2 gas generated causes nearby water vapor to condense, hence the appearance of fog. The volume of a cube equals the edge length cubed (a3). Now that we have the volume of the unit cell, we need to calculate the mass of the unit cell in order to calculate the density of Ar. The number of atoms in one face centered cubic unit cell is four. Two triple points: Diamond/graphite/liquid and graphite/liquid/vapor. Apply high pressure at high temperature. Ethanol mixes well with water. The mixture has a lower surface tension and readily flows out of the ear channel. First, determine whether each molecule is polar or nonpolar. Nonpolar molecules exhibit dispersion forces only. Polar molecules exhibit both dipole-dipole interactions and dispersion forces. Polar molecules with N–H, F–H, or O–H bonds exhibit dipole-dipole interactions (including hydrogen bonding) and dispersion forces. Both chlorthalidone molecules and hydrochlorothiazide molecules are polar. Looking at the molecular geometry, we see that the bond dipoles are not identical and therefore will not sum to zero. Chlorthalidone is polar and contains both N–H bonds and an O–H bond, so it exhibits dipole-dipole interactions (including hydrogen bonding) and dispersion forces. Hydrochlorothiazide is polar and contains N–H bonds, so it exhibits dipole-dipole interactions (including hydrogen bonding) and dispersion forces. 1) When water freezes it releases heat, helping keep the fruit warm enough not to freeze. 2) A layer of ice is a thermal insulator. The relationship between the edge length (a) and radius (r) of atoms in the face-centered cubic unit cell is . A face-centered metallic crystal contains four atoms per unit cell [8 × (corners) and 6 × (faces)]. Use the number of atoms per cell and the atomic mass to determine the mass of a unit cell. Calculate the volume using the edge length given in the problem statement. Density is then mass divided by volume (d = m/V). Be sure to make all necessary unit conversion. The fuel source for the Bunsen burner is most likely methane gas. When methane burns in air, carbon dioxide and water are produced. The water vapor produced during the combustion condenses to liquid water when it comes in contact with the outside of the cold beaker. Plotting the three points, and connecting the boiling point to the critical point with both a straight line and a curved line, we see that the point (20°C, 18 atm) lies on the liquid side of the phase boundary. The gas will condense under these conditions. 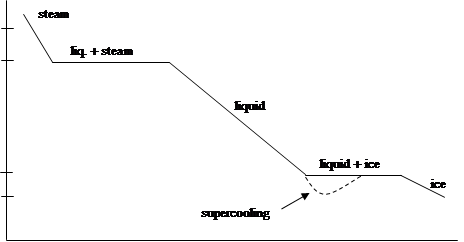 The curved line better represents the liquid/vapor boundary for a typical phase diagram. See Figures 12.34 and 12.35 of the text. First, we need to calculate the volume (in cm3) occupied by 1 mole of Fe atoms. Next, we calculate the volume that a Fe atom occupies. Once we have these two pieces of information, we can multiply them together to end up with the number of Fe atoms per mole of Fe. Next, the volume that contains two iron atoms is the volume of the body-centered cubic unit cell. Some of this volume is empty space because packing is only 68.0 percent efficient. But, this will not affect our calculation. We can now calculate the number of iron atoms in one mole using the strategy presented above. The small difference between the above number and 6.022 × 1023 is the result of rounding off and using rounded values for density and other constants. Overall, the plot is the reverse of that shown in Figure 12.33 of the text. A supercooled liquid is unstable and eventually freezes. If we know the values of DHvap and P of a liquid at one temperature, we can use the Clausius-Clapeyron equation, Equation 12.4 of the text, to calculate the vapor pressure at a different temperature. At 65.0°C, we can calculate DHvap of methanol. Because this is the boiling point, the vapor pressure will be 1 atm (760 mmHg). Next, we substitute into Equation 12.4 of the text to solve for the vapor pressure of methanol at 25°C. The original diagram shows that as heat is supplied to the water, its temperature rises. At the boiling point (represented by the horizontal line), water is converted to steam. Beyond this point the temperature of the steam rises above 100°C. Choice (a) is eliminated because it shows no change from the original diagram even though the mass of water is doubled. Choice (b) is eliminated because the rate of heating is greater than that for the original system. Also, it shows water boiling at a higher temperature, which is not possible. Choice (c) is eliminated because it shows that water now boils at a temperature below 100°C, which is not possible. Choice (d) therefore represents what actually happens. The heat supplied is enough to bring the water to its boiling point, but not raise the temperature of the steam. If half the water remains in the liquid phase, there is 1.0 g of water vapor. We can derive a relationship between vapor pressure and temperature using the ideal gas equation. To determine the temperature at which only half the water remains, we set up the following table and refer to Table 11.5 of the text. The calculated value of vapor pressure that most closely matches the vapor pressure in Table 11.5 would indicate the approximate value of the temperature. Therefore, the temperature is about 328 K = 55°C at which half the water has vaporized. For metals, increasing the temperature causes an increase in the vibrational motion of the metal atoms. This increased vibrational motion leads to an increased scattering of the electrons as they move from one region of the metal to another. This scattering decreases the conductance of the metal. For the aqueous solution, the viscosity of the solution decreases with increasing temperature. The lower the viscosity, the easier the ions can migrate from one region to another. This density is nearly 4 times smaller than the experimental value of 3.10 g/L. The hydrogen-bonding interactions in HF are relatively strong, and since the ideal gas law ignores intermolecular forces, it underestimates significantly the density of HF gas near its boiling point. Car engines run cooler in cold weather due to the improved heat transfer from the radiator to the cold winter air. This cooler operating temperature fails to heat “summer” oil hot enough to establish the correct operating viscosity (a “summer” motor oil will have a viscosity that is too high in winter). To compensate, use a “winter” oil that has less viscosity at a given temperature. At the lower wintertime operating temperature, the winter oil’s viscosity will be just right. Of the three compounds, only fluoromethane has a permanent dipole moment. Assuming that the dispersion forces are about the same in all three substances, we predict that fluoromethane will have the highest boiling point. d = 312 pm, λ = 0.154 nm = 154 pm, and n = 1. Cold water is warmed to body temperature in a single step: a temperature change. 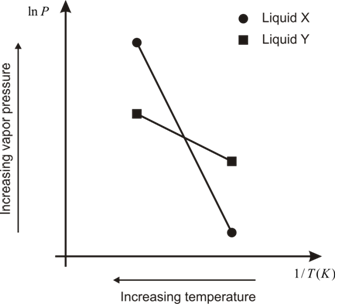 The melting of ice and the subsequent warming of the resulting liquid water takes place in two steps: a phase change and a temperature change. In each case, the heat transferred during a temperature change depends on the mass of the water, the specific heat of water, and the change in temperature. For the phase change, the heat transferred depends on the amount of water (in moles) and the molar heat of fusion (∆Hfus). The total energy expended is the sum of the energy changes for the individual steps. The specific heat of water is 4.184 J/g · °C. The molar heat of fusion (∆Hfus) of water is 6.01 kJ/mol. The molar mass of water is 18.02 g/mol. Therefore, it takes 1.39 × 103 kJ – 3.2 × 102 kJ or 1.1 × 103 kJ more energy if the water were consumed as ice. Given the vapor pressure at one temperature, use Equation 12.4 to calculate the normal boiling point. Temperature must be expressed in kelvins, so T1 = 275.15 K. Because the molar heat of vaporization is given in kJ/mol, we will have to convert it to J/mol for the units of R to cancel properly: ΔHvap = 2.88 × 104 J/mol. 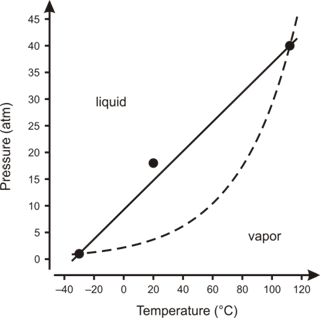 The normal boiling point is the temperature at which the vapor pressure is equal to 1.000 atm. Draw the Lewis dot structure and apply VSEPR theory to determine whether trichlorosilane is polar or nonpolar. Nonpolar molecules exhibit dispersion forces only. Polar molecules exhibit both dipole-dipole interactions and dispersion forces. Polar molecules with N–H, F–H, or O–H bonds exhibit dipole-dipole interactions (including hydrogen bonding) and dispersion forces. Trichlorosilane is polar but does not contain N–H, F–H, or O–H bonds, so it exhibits dipole-dipole interactions and dispersion forces. Calculate the volume of the unit cell using the edge length given in the problem. Determine the number of Si atoms for every B atom using the number of Si and B atoms in each unit cell. First, determine the volume of the unit cell in cm3. Then, we determine the number of B atoms in the unit cell using the unit cell volume and the number of B atoms per cubic centimeter. Finally, we use the ratio of Si atoms to B atoms to determine the number of Si atoms for every B atom in the sample. Determine the mass of Si atoms in one unit cell. Then, calculate density of pure Si by dividing the mass by the volume of the unit cell (d = m/V). The volume of the unit cell (calculated in part c) is 1.601 × 10–22 cm3. Determine the total mass of atoms in the unit cell using the number of Si atoms per unit cell and the mass of a Si atom in grams. Why is the mass of B not used in calculating the density of pure silicon? There are 5 × 109 Si atoms for every B atom. Therefore, the mass of B is negligible.